Remember, measures divide our music into smaller segments. Each measure can only hold a specified amount of music. The time signature determines how much music one measure can hold. Let’s compare that to baking. If you make cookies the recipe doesn’t just tell you to put in flour and sugar. It tells you how much flour and sugar to use. The recipe tells you to measure out a certain amount of the flour or sugar to make your cookies turn out just right. Our time signature does the same thing for our measures of music. A time signature has two numbers. The top number determines how many beats of music or silence allowed in one measure. The bottom number tells us what kind of note gets one beat. The most common time signatures have a 4 as their bottom numbers. Think of fractions here – the 4 tells us that a quarter note (1/4) gets one beat. So, if the time signature is 4/4 then we can fit 4 quarter notes’ worth of music in each measure. If the time signature is 3/4 then we can only fit 3 quarter notes’ worth of music in the measure. We have many ways to write 4 quarter notes’ worth of music. We can use one whole note, or two half notes, a combination of two quarter notes and one half note. If we want to make or rhythm more complex we can add eighth notes and sixteenth notes to our combinations. And if we don’t want sound on every beat we can use rests to substitute for sounds. We can write an entire measure of rests or we can write some notes and some rests. We can use any combination of notes and rests we like, as long as their total values don’t exceed the amount allowed in the measure. Look at the following graphics. These will help you remember note values and their comparable rest values. 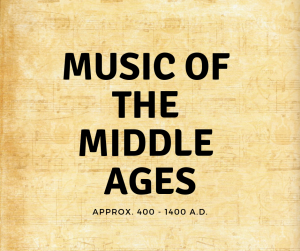 Welcome back, music history friends – let’s look at the music of the Middle Ages. The early music of this time probably would not excite you very much. You would probably think it was quite boring. Gregorian Chant or Plainsong was the main music of this time. The music changed so much that by the end of the Middle Ages the music was much more familiar to us. So, let’s see what changed. By the 1100’s music got another big change. A musician/composer named Pérotin started writing song with 3 or 4 musical lines. He wrote music with chords and three or four part harmonies. No one had done that before! When the Middle Ages started, performers memorized all their music. If you were in the choir, you had to listen to other people sing the music and learn it from them. Definitely not an efficient way to learn music! Choir directors were looking for a better way to teach music! The idea of writing music started with notations called neumes. Neumes were small markings above the words of the song to give some instruction to the singers. The neumes would show the correct way to pronounce the words of the song. They would give the singer some basic idea about whether the notes of the song went higher or lower. But basically, the neumes would just remind the singer of the songs they had already learned. Breakthrough!! Shortly after 1000 A.D. Guido de Arezzo, an Italian musician, got some ideas. He was tired of trying to teach new choir members how to sing all the songs they needed to know. It just took too long – like 10 years! He had to come up with a new system. He standardized the way musicians wrote neumes and made them easy to read and understand. Then he began to write the neumes on sets of four horizontal lines – like a staff with just four lines. The position of the neume on the set of lines gave a pitch position – whether the sound should move higher or lower. The French musician, Pérotin, came up with a written way to indicate rhythm. Now the choir members could learn their music by reading it from paper instead of learning it just by listening. And as the music got more complex, it became even more important to have a way to learn the music faster. Being able to write music on paper changed the way musicians “wrote” music. Before this, if a person came up with a new song he would sing it over and over to everyone he knew. Then they would sing it repeatedly to people they knew, hopefully without changing the song at all. But now a person could think of a new song, write it on paper, pass the paper around, and people could learn it exactly the way the composer wrote the song. Being able to write the music down also allowed musicians to write more complex music. Now composers had a way to claim ownership of their music. They could sing their names on the paper with their music. Most of the instruments we are familiar with today did not exist in the Middle Ages. But some of the “ancestors” to our modern instruments were available. Musicians had several different pipes (wind instruments). The bagpipes were around during the Middle Ages. There were also many stringed instruments: the dulcimer, the psaltery, the hand-held harp, the lute, and the viol. Sometimes a group of instrumentalists played together to entertain at a banquet or to provide music for dancing. They did not use groups of instruments to accompany singers. Pérotin was a French composer from the 1100’s. He experimented with chords, written notation for rhythm, and placing neumes on a set of four lines to show pitch. John Dunstable’s contribution to composition was the concept of chords, especially triads. He is known as the father of the triad. So, by the end of the 1300’s almost all the important elements of western music had been discovered. Musicians found a way to write music on paper. They progressed from just a single melodic line to multiple voices layered together, their music contained organization and structure. The basic foundation of western music had been created. Pay your music teacher! Music lessons are not cheap. There, I said it. I know that from experience. But I have also learned that, for the most part, you get what you pay for. Not always true, I know, but most of the time it is. When you want quality, it costs you. And you should want quality for the music lessons you pay for. Granted, a beginner does not need a symphony-level instructor, but you should expect quality from your child’s music teacher. And that means you pay for it. 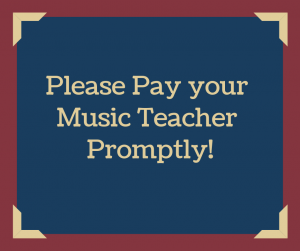 Now, I’m not going to tell you where to come up with the money to pay for your child’s lessons, but I want to help you understand what determines the price your music teacher charges, and how he/she expects to be paid. First of all, understand that a qualified music teacher has put in a lot of time and effort to become qualified. The teacher probably started practicing at a very young age and put in countless hours of practice before he/she even started college! Many music teachers studied music in college – they could have been performance majors, music education majors, or pedagogy majors. They put in the time and effort to be prepared to teach your child. Your music teacher is a professional, and he deserves to be paid as a professional. What determines the cost of music lessons? First, your location plays a role in the fees a teacher charges. Teachers in urban areas often charge more than teachers in more rural areas. Competition is greater in cities, living expenses are often greater in cities, studio space rental fees are usually higher in cities. Remember, your music teacher is a small business professional. This is her job. She must pay expenses, taxes, insurance, etc. Secondly, your teacher’s education and experience help determine his/her pay scale. The greater his experience, the more he is justified in charging for lessons. Usually a music teacher will study the market, get a feel for reasonable lessons charges, and try to set a comparable rate. How or when does my child’s teacher expect me to pay? Good question. When I was in grade school, I remember walking to my piano teacher’s house after school, handing her a $5.00 bill, and sitting down to take my lesson. Things have changed since then! Some teachers still ask to be paid each week when a child comes to a lesson. Others request to be paid monthly (number of lessons in a month multiplied by the amount per lesson). Many other teachers operate on a term or semester basis. They will calculate how many lessons are in the given term, how much per lesson, then give you a total amount you owe for the term. They may expect you to pay for the entire term at the beginning of the term, or half at the beginning of the term and the other half at the midpoint of the term. Usually, paying your music teacher by check makes it easier for them to keep their records correct. Some will even take credit cards. What about missed lessons or cancellations? Be sure to discuss this with your music teacher when you start lessons. Each teacher or studio has its own policy. Find out what it is and keep a copy of the studio policy. Some teachers will work with you to reschedule in case of sickness or emergencies. Some build an extra lesson into their studio term. Others will reschedule if the teacher misses a lesson, but not if the child skips the lesson. It is your responsibility to know the teacher’s policy. Don’t expect the music teacher to make exceptions just for you. Finally, most importantly, pay your music teacher promptly! Remember this – your child’s music teacher is teaching because she loves to teach and see children learn, but this is still her job. She has bills to pay, expenses to meet, and she is depending on your payments to meet those expenses. The teacher still must pay her bills on time whether you have made your payment or not. So, pay your child’s music teacher with a smile! Author amusicmomPosted on October 1, 2018 September 30, 2018 Categories ParentsLeave a comment on Pay Your Music Teacher!